In London, you make you way first and foremost with the Underground - The Tube. London is also a very walk friendly city where you will pass many sights while you're on the go. Do not forget to drive on the left and look in the right direction when you cross the streets. With the subway you quickly move to different places, if you want to do many things on the same day. Now you can travel by subway after midnight on Fridays and Saturdays. Tip! Buy an Oyster Card before you leave home and travel easy on the subway and London busses. 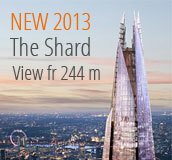 The subway stretches in the central parts of London and the surrounding areas - Essex, Ford Heart and Buckinghamshire. The first line opened in 1863 - this makes the London Underground the world's oldest subway system. It could have been even earlier if it had been built as planned - in 1854. The London Underground has 11 lines: Bakerloo Line, Central Line, Circle Line, District Line, Hammersmith & City Line, Jubilee Line, Metropolitan Line, Northern Line, Piccadilly Line, Victoria Line, Waterloo & City Line - In 2010, it may be a 12th line that perhaps will be called East London Line. The easiest way is probably to take the subway. There are many routes to choose from that go almost everywhere. When you're on the go, you see the sign to the underground - with the name of the station. Some stations may feel a bit confined and cramped when you walk down several steps and then walk around in a lot of underground passageways. Be aware of the signs so you do not take the wrong tunnel. It can be quite a nice walk if you pass a musician that plays guitar and sings. Night Tube means that Londoners and visitors can travel on Friday and Saturday nights and the early hours of Saturday and Sunday morning. At almost every station, there are maps of how the lines go - you will also see them inside the trains. Tip! During the Summer - bring a bottle of water because it can be really hot in the subways and inside the trains. The price usually depends on the number of zones you will pass. Prime center is number 1. No. 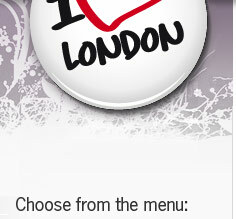 6 is located far out, this includes eg London Heathrow Airport. - In some places there is a manned ticket office. - In most places, there are ticket machines where you can buy tickets for different lengths of time and zones. Some take only coins and some take only cards. More and more machines take debit cards and credit cards. So do not forget to bring some coins and your credit card if you want to by tickets in a machine. As I said, getting down to the trains can take a little time .... it can be quite looong aisles. See here! Klick on the play button under the movie or in the movie window - to start the movie. Oyster Card - A must have! 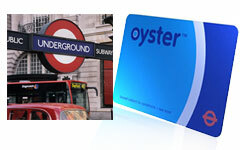 To move as easy as possible, we recommend an Oyster card - the "little blue card". With this card you can travel smoothly at any time. The card is also valid on buses, trams and trains "the Docklands Light Railway". Oyster Card started in 2003. You buy a card for example 10 pounds - since money is deducted automatically every time you use your cards. You can then recharge your card at various places with for example your credit card. Oyster Card will be much cheaper than if you buy the day ticket and you may also save on some boat trips - see details where you buy boat tickets. There is also a Travelcard that you can buy for different days and zones. You buy your card at the manned ticket office (if you do not buy it before you go). Do not forget to save your card if you have plans to come here again! You can just recharged it again. How do you use your Oyster Card ? If you go underground you will reach a barrier and there is a yellow "thing" that you just drag / put the card over. Then the gate opens. You pass a similar gate, when you go out from the station, where you must drag the card again. Very easy! 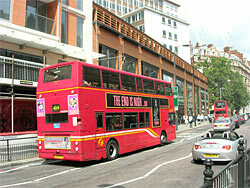 In what other city than London are the red buses such a famous tourist sight? Double-decker speeds around town and you need to watch out when they take off. There are over 700 routes to choose from and there are around 7,000 buses. We certainly think that you should ride the bus on time and sit upstairs. It is like a little sightseeing tour. You never know what you will pass. There are also buses that are not "Double Deckers" - they are called "bendy" buses. Coaches usually have a number that you see on the front, side and rear of the bus. Some lines have also letters. You can also see the name of the end station. You can not pay with coins on the bus. You need a payment card that can be used on the bus. You can buy an Oyster Card that takes you around most of London's travel services. If you want to buy a ticket, there are usually ticket machines at the bus stop. You can also use your Mastercard, Visa card called Contactless Payment Card. The cards must have the symbol to use as debit cards without entering the card's PIN. Do not forget to activate your card for foreign payments. Keep in mind that it is up to a certain amount. Double-decker was simply a way to carry more passengers in a bus. They also exist in other European cities and in some parts of Asia, Sri Lanka and Hong Kong. The buses began to appear in London around 1950. There are bus companies that arrange sightseeing for tourists. 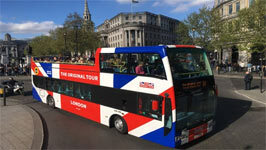 These companies are Big Bus Company and the Original London Sightseeing Tour. On these buses you can buy day passes that apply throughout the day and you can jump on and off as many times as you want! These lines depart from the special bus stops - you can not miss them. They stop and start often from the most famous tourist places. 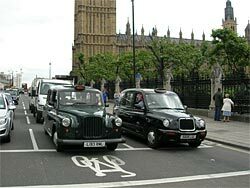 They operate all over London streets - those cute little round black cars "the London Black Cabs". If you need a taxi, wave to the car but check the sign on the roof first, is it lit (yellow light) with "for hire" = available. Go in and sit behind the driver in the back seat. All taxis have a taximeter which is clearly visible. The cars can take at least five passengers and if you have young children there is often a car seat in the cab. For those who are disabled, you might take the wheelchair in the taxi, just ask the driver. A taxi driver in England must undergo extensive training and learn all the streets of London. You will not end up at the wrong street if you choose a London Cab. Prices may go up a bit more after 20.00 at night. Fun facts: The taxis are so called Hackney Taxis and they started in the 1700s with service in London. In 1907 the first taximeter was used in the cars. London is focusing on more and more people using the bicycle in town. 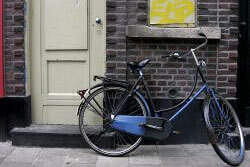 You can rent bicycles from over 400 places in town. When you bike, take it easy, remember to drive on the left! Helmet, you can rent and maps are usually included. Most accidents occur when cars do not see when a bike shows up. Dress so they can see you! it´s worth it. One suggestion is to ride beside the River Thames where the cars are not running. Be ware, however, for uneven roads and tunnels where you might have to duck (when the tunnel is to low). 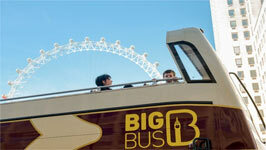 If you have travelled around London by subway, bus and taxi, we recommend a trip by boat on the river Thames. You will see the city from a totally different perspective. 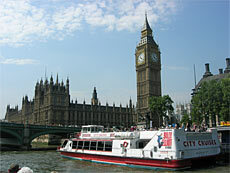 There are many different tours: From Wesminster Pier which both leaves up and down the river Thames. You can go to Kew Gardens, Hampton Court, etc. More piers are Waterloo, Embankment and London Eye and Tower Bridge Piers. Do not forget to wear a good pair of walking shoes. Have you perhaps forgotten your best pair at home you can always go into a store and buy some. Most of the inner city is within walking distance... if you're willing to take another 20 minutes or so. Get a good map and then just start walking! Big Ben close to Westminster Abbey and Buckingham Palace. If you take yourself to the other side of the Thames, you can start at London Eye and walk to The Tower Bridge. Some crossing points you will recognizefrom the Beatles album "Abbey Road". There walks Beatles gang over the white lines. 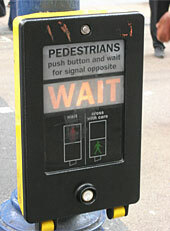 Elsewhere, you must press the button to go over - wait for the green man to light up. Well, it's perhaps not a way of travel to get around in central London, it's probably more of an experience to go with the new cable car across the Thames. The cable car takes you from the ExCel exhibition center in Royal Victoria Dock and London O2 Arena on the other side of the Thames. If you have an Oyster Card you travel with discount.